The Herald editorial of 30 August entitled “Housing options show little to fear from in-city growth” is a terribly flawed assessment of the problems surrounding infill. (Click here to read the Herald’s piece) Several samples from that missive follow. I have italicized certain portions. The only reason that the Herald can attempt to make these statements with a straight face is that the Herald readers cannot see the faces of the editorial board who penned these words. I would agree with the Herald IF I saw a city that would expend as much effort in enforcing its codes AFTER construction of these infill “tool box” gadgets as it does prior to their construction. One only needs to look at the non-enforcement of codes to date which has resulted in illegal rooming houses all over town. The reason the Sunnyland residents are up-in-arms about the development of 4 acres on Sunset is that they did not just fall off the turnip truck and are acutely aware of that which happens several years down the line when the glow of new construction has worn off and the reality of uncontrolled “rental creep” and concomitant overcrowding work to gnaw at neighborhood character. The homeowners on Speiden Place and Speiden Lane off San Juan Boulevard now have to contend with a 12 acre annexation by the city with zoning that calls for higher density than the surrounding area. They might be more accepting of this infill, were they able to trust the city, however a quick trip to Magnolia Hills or any number of small lot cul-de-sacs around town wrenches them from their reveries. These two cases are excellent examples of the emptiness of the claim by the city that the neighborhoods will have control of “the where” of infill. The Herald ends its editorial with this admonishment, bordering on the ludicrous, "change can be positive if citizens work hard to make it so." I find this statement aberrant in that it is not the residents who should be charged solely with making it work, as if the city and the council were innocent bystanders in the process. Imagine a call from the Herald to the city to do its job. If imitation is, indeed, the most sincere form of flattery, I should be flattered. Instead, I am just happy to see someone else take on the local mugwumps and self-proclaimed kahunas of academe. My blog entry of 17 August entitled “Singing the Single Family Blues in the Bluegrass State” (Click here to read that entry) described a single family zoning situation in Lexington, Kentucky, similar to the one we find in Bellingham. Citizen activist, Dennis Duross, in Lexington has launched his own blog, akin to Twilight Zoning in Bellingham. His blog, entitled Pigs in the Parlor can be found by clicking here. Interestingly, Dennis' blog entry cites another US Supreme Court decision on zoning, Euclid v. Ambler Real Estate. (Click here to read about that decision.) Regarding the results of landlords packing rentals Dennis states, “…as noted 82 years ago in the US Supreme Court decision Euclid v Ambler Realty Co. …these are but symptoms of crowding a temporary population into spaces and places that were never intended to accommodate them, and that the zoning law (which that decision upheld as valid) does not allow." Driftwood has provided an update to his comments regarding the meeting in Sunnyland on the development of the 4 acre parcel adjacent to St. Sophia Greek Orthodox Church. However, caveat emptor. "As a follow-up to my story yesterday, and in the interest of fairplay, I'd like to tell you about the next day's Charrette meeting where the design consultants presented a revised plan as a result of citizen inputs and further research. I went to the second meeting fully expecting to see the same displays and smiling faces and a reiteration of the 48 unit plan...so much for preconcieved notions, no, they didn't fall on their swords and take the density down to the 24-28 unit density we asked for, but neither did they ignore us entirely and hold out for the upper figure. The plan presented at the second meeting was for 35 units and it replaced the drive thru from Sunset to Illinois with a bike /walking path lined with a linear wetland or watergarden. This concept had 4 or 5 houses facing onto Illinois and made the whole thing a lot more comfortable for the surrounding neighborhood in my opinion. I can't speak for my neighbors, but I thought the comfort level in the room showed much improvement over the previous night's proceedings. I was impressed by the hard work that the design firm had accomplished in such a short time and looking at their proposal think that the revised plan may actually enhance the area. On the first proposal I saw nothing that I though would serve as a draw into the developement that to link us with our new neighbors, but the trail and wetland will allow bike and pedestrian access and limit the traffic that we feared, it also looked like a feature that would draw in folks out for a evening walk and tie the community together. We heard from some folks from the Planning department and a fellow from the Kulshan Land Trust and got a fair explanation of the Urban Village concept that they see for the Sunset district. We heard from the developer and he gave a very erudite expanation for what he would like to accomplish with his property, he spoke of affordable housing and his desire to build quality homes. I may be naive but I though the man was sincere and well spoken, if he does all he said he could do then I wish him all the best and won't begrudge him the pleasure of a Montana lodge and a fine driveway for his Hummer, I don't think there is anything wrong with him making a profit on his investment if he can preserve the quality of life for the surrounding community. On the first evening we saw a few folks who were upset with the process (the idea that the design firm was not taking our desire for less density into account) leave the meeting. Maybe they were making a statement, perhaps they just had somewhere else to go, but my feeling is that we must stay involved in the process and keep an open mind. The design firm made adjustments, the current residents saw a better picture, and while I didn't know if the developer was thinking about any compromise, I saw a human face, he seemed like an intelligent person who might surprise us. Maybe we will still have to deal with a wolf in sheep's clothing but I urge all of our concerned citizens to stay involved, think about things like urban sprawl and what happens when good people fail to pay attention, and attend these meetings to participate with some of the fine folks who want to make a difference. If we do this right, we, the citizens of Sunnyland, can show the rest of the town that we are willing to do our part to bring about a vision for the future and can count on a vibrant, thriving, liveable Bellingham in the future. I would particularly like to thank my fellow neighbors who have been on top of this issue and the Zonemaven himself for making this forum available for citizen comment, these are some of the people who make this country great! Driftwood"
The fourth leg of the City Council’s six-legged stool on single family zoning issues is enhancing enforcement of code violations, AKA the upgrading of the Litter Control Officer position. (You can read about the first three by clicking here, here and here) This leg was designed well ahead of the thought that it might one day become one of six attached to a broad stool but, no matter, it has taken time to develop. Terry Bornemann asked for a pilot program to enforce the single family zoning code on the 8th of October 2007. In February 2008, he and the other council members received a Goldilocks version of this from staff who presented it as three choices regarding hiring another code enforcement officer (too expensive), adding duties to the current Code Enforcement Officer position (too burdensome), adding duties to the existing Litter Officer position (just right?). As the newly appointed Chief of Police, Todd Ramsay was charged with putting this all together since the Litter Control Officer (who was then paid totally by Public Works) was already under the operational control of the police department. The following comment by “Driftwood” was left on my blog entry of yesterday (20 Aug) entitled Design Charrette? Sunnyland Beware. It was just too good to leave buried as a comment so I am reproducing it here. Any further comment by me would be polishing the hole. "After attending the "Design Charrette" or "Poop Wagon" it seemed to me that the design firm hired by the city might as well been working for the developer directly. The proposal they submitted may not have been the highest density possible, I suppose we could fit a few more people on there if we stacked them like cordwood, but they had 48 units squeezed onto the lot! This does not fit into the existing community, the Sunnyland residents seemed to think that about half that number, anywhere from 24 to 29 units was a reasonable compromise, the developer wanted 49 units...what a coincidence! If the design firm was unbiased and impartial how did they arrive at such an inflated figure and why did they totally ignore the input from the current residents? Are we paying these folks or is the developer? They presented an impressive bunch of diagrams, illustrations and color pictures that I must admit, were very pretty...there were just too many of them! The folks that did the presentation were personable and friendly but that doesn't mask the fact that they were trying to fit too many houses into too small a space. Who stands to gain from this whole project and who stands to lose...that is obvious. The developers interest lies in placing as many townhomes, duplexes, and cottages as possible onto the property, more money for him and I suppose he can get away from it all with an nice big Mc Mansion in Montana perhaps complete with a big log arch over the driveway to drive his Hummer under. We, the residents of Sunnyland, who purchased our homes in this neighborhood for the character of the area will bear the brunt of the project if it goes forward as currently proposed. The design firm indicated that each unit would have parking for 1.5 vehicles, great...what about when they have visitors or what if they have more than one vehicle per household, and who has half a car anyway?! Where will the overflow parking go since they want to build with such density? My guess is they will park out into the surrounding neighborhood and you will find yourself parking a block and a half from your house and the effect will cascade down thru the area, so, even if you don't live immediately adjacent to this conglomeration, plan on seeing strange cars parked in front of your home. They didn't address the impact of all the new traffic on the area and the intersection at Sunset and James already experiences backups quite often, a lot of this traffic will be forced into the neighborhood to the south meaning more traffic thru what right now is a wonderful, quiet residential area. Zoom, Zoom. One nice woman, whom, I'm sure was offering accurate advice, told us that we needed to draw up our own pictures and presentation to offer the city council since "they really liked that!" The developer has the resources to hire professional artists and draftsmen to come up with some really flashy visual aides to wow the council...although he really doesn't have to since the folks hired by the city seem to have achieved that already. Why should we have to convince OUR elected representatives to do the right thing for the neighborhood? Ideally a lot of folks would like to see the same number of homes go up on the site as already exist in it's surroundings in order to preserve the character of the community, the value of their homes, and the quality of life, but, we recognize that for the good of Bellingham and it's environs and to avoid sprawl and maintain our open space we need infill, but it needs to be done correctly balancing the needs of the current residents, newcomers, and the property owner...the proposal as it stands now needs to be revised, 48 units is not a compromise, we know when it's not rain that’s falling on us." Charrette: a French word for a wagon used for carrying the condemned to the guillotine and, alternatively, for hauling manure. The following is from an interested reader and speaks to the need for landlord licensing. "When we first moved to Bellingham in 2001, we went to several rental agencies to try and find a house in which to live. Two professional adults were shown the most run down, decrepit houses unfit for living. The floors were cracked and rotting, the ceilings had large, gaping holes, the paint on the walls was peeling... Need I say more? When asked if the landlord/rental agent would be renovating, we heard guffaws and snorts. We were told that Bellingham was a student-driven market and that any house we wanted within our price limit would be a run-down rat-trap. My words, not theirs. Our first rental was in Xenia Lane area. Not a pretty neighborhood. We tried to make it more livable, but the residents were not interested in keeping the space proper. Very loud, rampant and unattended children. Each person lives as he wishes. This is why we looked for a more pleasant neighborhood. As suggested by many, we moved. Luck us! Since purchasing a condo, hoping for a quiet dwelling away from renters(! ), we have seen the phenomenon of condo owners who rent out their property without a permit to rent. It is so much fun to live in a quiet community with 5-8 students who party all night. Whom do I call in these cases. I won't risk going over to complain to drunk students/young adults. I was a student for about 9 years. I always lived near campus in a single apartment, campus housing, or a rental house meant for a couple. This was in Kansas. Personally, I don't know that students should be all required to live on campus. The dorm rules can be a bit silly. They tend to treat students like 15 year olds. No boys in the room after 12 midnight. No alcohol in the room-even if you are 21. Get out fast during Winter Break. No coed living. These are some rules with by today's students are not ready to abide. They feel that are independent, young adults. They do not want the Resident Assistant watching over them like a child. I believe that the university should move from the double dorm room or quad suite situation to more of an apartment/rooming house situation. I would recommend that freshman and sophomores live in a "traditional" residence hall and have Resident Assistants so that they have some similitude of guidance in their first and second years away from home. However, when students reach 20-25 years old, they should not be subjected to some of the more restrictive policies of the typical residence hall. I had this experience and I moved out of the residence hall after my 2nd year. If the university could buy land and build basic homes (1-2 bedrooms) and apartments in 3 zones around town, near bus lines, or near the university, then the community would perhaps feel some relief from the current situation. I read 6 months of your blog. Some of the posters feel very strong about your ideas-both for and against your purpose. I can see both sides as I have recently been a renter and now live in a purchased condo. I wish you luck and look forward to reading more." The reader's experience is not unusual. 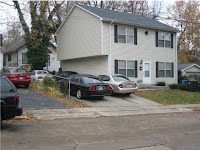 See my blog entry Misrepresenting Single Family Home Rentals of 23 Oct 2007 (click here to read). I received the following emails and photos from some readers in Lexington, Kentucky which is the home of the University of Kentucky with approximately 27,000 students among its 279,000 citizens. For purposes of comparison, Bellingham’s WWU has about 12,500 students among 75,000 citizens. We are here in Lexington, Ky and experiencing similar problems in our neighbourhood which is close to the University campus. Our issues and attempt to get City Council to work with us sound identical to yours. Attached a couple of snaps taken round here of "group rental homes." [See photos below] This is an uphill battle for all of us. We no sooner make some headway with the students than it's time for the old bunch to move out and a new bunch to move in. I happened on your blog… this afternoon. We have exactly the same problems here in Lexington, Kentucky that you have in Bellingham (my wife and I went to grad school at WSU in Pullman: Washington's a beautiful state). I don't know whether to be encouraged or depressed. Anyway, I notice that a fair amount of talk on your blog centers around the definition of "family." That's the case here as well. My contention here is that the term "family" is part of the problem. One argument about student rental houses used to be that "...these are single-family houses, and the people living in them are clearly NOT members of the same family..." The result was that the definition of family was expanded to include any number of unrelated people who customarily live together (or words to that effect). So helpful. I don't believe the purpose of any zoning ordinance is to support a given view of "family," whether traditional or nontraditional. We make the mistake of calling our "houses" by the name "single-family dwellings," and by doing so suggest that the underlying intent of a residential zone has something to do with encouraging families to live in the neighborhood. 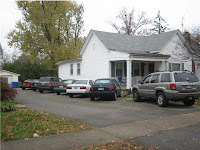 The small houses in the neighborhoods that surround the University of Kentucky were built 80 years ago, and were intended to be homes that people would buy and live in. The American Dream of home ownership. In other words, they were intended to be owner-occupied. As such, they were built to appropriate specifications, and were supported by an appropriately sized and scaled infrastructure, etc. Were they envisioned as profit centers intended to warehouse renters in unsafe and unsanitary conditions? No, of course not. That's what the builders of the early 20th century were trying to offer: an escape from the filthy, cramped, unhealthy, and crime-ridden tenements of the cities, not a return to them (albeit some 80 years later). That's what the ordinance intends: owner occupation. As it turns out, it's also the easiest thing to determine, as the publicly-accessible property valuation website lists who owns what, and where they reside relative to that. If an owner doesn't resides in a house he owns, it should (I argue) be considered a lodging house (an illegal use in our R1 and R2 zones) by default, and should be either regulated appropriately or shut down. I'm having one hell of a time getting any traction for that view here, which either means that I'm wrong or that I'm right. This is the reply I sent to to Dennis: Thanks again for your comments. … The family definition issue is a contentious one, no doubt. … Maybe we ought to just eliminate the word and replace it by a term like "single social group" while keeping the same definition. Zoning, as I see it, is for limiting uses. For single family/multifamily areas it is density. Families, for planning purposes, tend to average out. In this town, family units are less than three on average. So, families are somewhat self-regulating as they average out. Singles renting homes are not self-regulating in that way. The economics drive maximum occupancy. As for owner occupancy, 50% of Bellinghams' single family homes are rented, most by students from Western Washington University. A total shut down of these rentals would be an interesting undertaking and politically impossible. Regulating is next best but there is stiff opposition here from the landlords, who, by virtue of their associations, can mobilize. Even among the live-in homeowners here there is a laissez-faire attitude which I find incomprehensible. Many want to fight the parking, noise, litter, etc. That is like fighting tuberculosis by giving cough suppressants. We had one episode in which the police did perform a mass ticketing for parking violations all along some streets where illegal rooming houses proliferate. The screams from the students (and the WWU administration) were deafening. The result: no more such ticketing. As for Kate's comments, she has raised a good point. Dealing with the turnover of thousands of student renters annually means that enforcement efforts across the board must be constantly and evenly maintained. The university must accept a major role in educating students, not only about behavior but also on the laws pertaining to home rentals. One home-owner here, who has made it a point for years to meet with and engage students moving onto his street, said to me, "I am tired of training these puppies." City Releases Draft Bellingham Infill Toolkit - What Is the Point? On August 15th the city released the draft “Tool Kit”, recently sprung from the loins of Planning Academy II. You can read this document by clicking here. Beware of the photos of pristine homes as they will bear little resemblance to reality. In the event you want to see what happens when you have no zoning enforcement, check out the photos (click here) on my blog entry on the Planning Academy which I wrote in June. Here is an example of an attempt to create small homes on small lots without any enforcement follow-on. "I am a homeowner in the Magnolia Hills subdivision, and live on Wildflower Court – a cul-de-sac. When we moved into our single family–zoned neighborhood four years ago from our previous residence in North Bellingham, there was only one rental property on the far end of neighboring Wildflower Way, occupied by a number of unrelated individuals. Judging by their ages, they were students. Today, four years later, there are six group dwellings of a similar nature in this small residential subdivision. Our once quiet cul-de-sac must now be one of the busiest in all of Bellingham because of the 24/7 coming and going of a multitude of cars, vans and trucks belonging to these young renters. There are many children living on our cul-de-sac and parents are justifiably concerned when few of the rooming houses’ occupants observe speed limits. When we do attempt to remind them of these limits, more often than not we get the one-fingered salute in response. And because of the failure by City authorities to enforce its own Municipal Code, the quality of life on our once-quiet cul-de-sac has significantly deteriorated in a short four years. " F. 1. Family: One or more persons related by blood, marriage, or adoption, or not more than 3 unrelated persons, living together within a single dwelling unit. For purposes of this definition children with familial status within the meaning of Title 42 United States Code, Section 3602(k) and individuals with disabilities within the meaning of Title 42 United States Code, Section 3602(h) will not be counted as unrelated persons. "Adult family homes," as defined by RCW 70.128.175, are included within the definition of "family." Facilities housing individuals who are incarcerated as the result of a conviction or other court order shall not be included within this definition. The term single family is woven throughout the municipal code to such an extent that elimination of the definition is not feasible. Our Planning Director, Tim Stewart, has spoken to the city council on precisely that difficulty. So it remains to the city government to define family. In 1974, the US Supreme Court upheld a zoning ordinance definition of family which limited the number of unrelated people in a single family rental to two. Justice William O. Douglas wrote the majority opinion. (If you find this surprising, you are likely well over 50.) You can read his opinion by clicking here. Since then, numerous state supreme courts and lesser courts have similarly ruled. The precedents are there for such limitations on the number of unrelated people. The law states a number only. It is silent about living arrangements. Justice Douglas said in his 1974 opinion “…every line drawn by a legislature leaves some out that might well have been included.” Similarly single family zoning law in Bloomington, Indiana was upheld by that state’s supreme court where the justices said in part “the zoning ordinances may ‘regulate how real property is developed, maintained and used,’ including the implementation of ‘standards for population density and traffic circulation’ and ‘any other provisions that are necessary to implement the purposes of the zoning ordinance.’ " You can read the entire decision by clicking here. One way or another, you have to define your terms. The current definition of single family, which underlies the concept of single family zoning, is a valid one though some may not like it. (For the record, I support adding domestic partnerships to the single family definition.) One must not forget that the term single family also appears throughout the neighborhood plans, some of which have just been reworked after hundreds of hours of work by unpaid neighborhood representatives. All the foregoing, comes on the heels of Planning Academy II where the mantra “the neighborhoods will decide ‘the where’ of infill” was trumpeted repeatedly. Yet there are those who would blithely alter or attempt to eliminate altogether the basis for single family zoning, thus creating a totally uncontrolled and unregulated infill of the type unfortunately seen already on too many streets throughout the city. Today marks the first anniversary of Twilight Zoning in Bellingham. Since its inception, I have created 133 posts, many with your suggestions. The blog has been visited nearly 10,000 times. With your assistance, we have seen the council move from no action on illegal rooming houses to the recent buzz of activity and a suggested comprehensive look at the problem. I will continue to write about illegal rooming houses and the lack of enforcement of not only our zoning laws but other codes whose purpose is to maintain our quality of life. With 75,000 residents and attendant increased density, Bellingham, can no longer afford to operate as it did decades ago. Another one of the six items (proposed by Jack Weiss) related to home rentals in our fair city is licensing of landlords. To that I would add, licensing of rental units, i.e., single family homes. This idea has been percolating for years, as issues have a tendency to do in these parts. The last iteration was a goat rope* at the Cruise Terminal in November of 2004 which was overrun by the landlords whose sole concern seemed to be not creating another layer of bureaucracy for the city – how thoughtful. Here is Council President John Watts’ closing statement retrieved from the council’s public record of the work session. “WE HAVE HEARD YOU TONIGHT! 1. Gather all comments, review them and post them on the City’s website. This also includes the Police Dept statistics by neighborhood. 2. Set up a follow up meeting early next year, say January or February, to summarize our conclusions from this meeting, present our recommended action plan and get additional feed back from this group. If that feedback is positive, we will proceed accordingly. If additional substantial changes seem necessary, we’ll reiterate this process and set up other meetings until we arrive at an action plan we can all agree upon that has a high likelihood of success. 3. Develop and adopt an action plan, likely to contain a number of the elements and methods that have been identified here tonight. Distribute this plan and enlist the help needed from those involved to implement it. 4. Set up an Advisory Committee representative of this group to become an integral part of implementing any action plan agreed to. This Advisory Committee would monitor the program’s performance; be available as a resource in its application; coordinate with the Police Department, WWU, NW Rental Association and others as required; and periodically provide feedback to the City Council. 5. Evaluate the program and determine its success, or whether modifications are necessary after a trial period of one-year. We sincerely hope this process will work to correct the persistent, annoying problems that are being experienced, but it will likely require active involvement from all stakeholders to achieve this success. The last thing we want to do is come back later with another version of an onerous ordinance to address problems that can be more effectively handled otherwise. There being no further business, the meeting adjourned at 9:32 PM. · A landlord registration database with contact information for property owners. · The colleges and University hold student tenants accountable for their behavior possibly withholding grades or even degrees, as do some private schools on the East coast. · The group agreed about the need for enforcement of nuisance laws but recognizes the lack of personnel and funding. · A solution that holds everyone accountable, possibly a $10 annual property tax on every residential unit. · A program of incentives, where landlords pay a fee and then receive a rebate on problem-free properties. From all appearances, nothing was done in spite of John Watts’ insistence that the council heard “something” that night. The council must have just heard the landlords as I checked council minutes for the two months after Ms. Rootenberg spoke but her plea had to have fallen on deaf ears. The issue seemed to have died, no doubt to the immense relief of the landlords. What will keep the issue alive this time, if at all? So I am addressing this to those who were council members at the time -Gene Knutson, Barbara Ryan, Terry Bornemann and Louise Bjornson – and to those who are new to the council – Stan Snapp, Jack Weiss and Barry Buchanan. If our citizens are wary of this, the latest approach to the issue of landlord licensing, it is because of painful experience. - An annual fee to license each rental. Fees will pay for program and code enforcement. - Safety and health inspections of rental units – to include occupancy. - System of fines for non-compliance. - Promote the health, safety, and welfare of the general public. - Assure preservation of the existing housing supply. - Help maintain property values. - Work toward eliminating substandard and deteriorating rental housing. - Maintain a living environment that contributes to healthful individual and family living. We should do the same for the citizens of Bellingham. In my blog post of August 5th, I indicated that I would speak to the six issues regarding illegal rooming houses which Councilman Jack Weiss surfaced during the August 4th council meeting. Instead of taking further specific action on changing the municipal code definition of family, the council decided to take a comprehensive look at the problem. All well and good, but as I have said many times before in this blog, changing a code that has never really been enforced or that has not been tested in court seems, shall I say, a bit odd. Nonetheless, no known governmental entity has ever eschewed oddity, to my knowledge. One could envision a sliding scale of sanctions such as increasing fines for repeated violations of the single family code to a certain threshold at which time additional offenses would revert to a criminal matter. This will ease the mind, somewhat, of those who are not comfortable with a stiff penalty for a first offense and prefer to see an “educative” process, although some offenders, was we note, are slow learners. Salisbury, Maryland has an entire code portion on Infractions and Civil Zoning Violations (click here to read that code). Perhaps our planners might want to contact the city management there for ideas. Jack Lennox is the Director of Planning and Zoning. He can be reached at jlenox@wicomicocounty.org or 410-548-4860. Of course, all of the above is meaningless unless there is a credible threat of enforcement and that cases are handled expeditiously. Those of us who have made formal complaints on illegal rooming houses have found neither an expeditious process nor a comprehensible one. But that is another subject which I will take up shortly. At last night’s City Council meeting the council members (Terry Bornemann was absent) voted to not continue pursuit of changing the definition of family for the time being but to look at a host of related issues, six being offered by Jack Weiss. Today’s Herald carries an article on the meeting. Click here to read that article. Decriminalization of parts of the Bellingham City code to ease enforcement. Changing, in some manner, the definition of family. Enhancing enforcement of code violations (upgrade of Litter Control Officer position). Beginning a dialogue with the new WWU administration under its new president. All of these are laudable efforts, however, as always "the proof of the pudding is in the eating." This should not deteriorate into simple noodle pushing. Over the next several weeks I will write separately on these six topics. On August 13th, this blog celebrates its first anniversary. To fete the occasion, I have reproduced below my first blog entry, which was initially sent as an email to all the candidates running for city office. It is as relevant today as it was then. Perhaps I will not have to wait until August 2009 to write the closing chapter. The candidate for any city office who wants my vote will have to provide some concrete solutions to end this mess the City of Bellingham calls zoning. Someone has to get out in front of this issue for once and for all. Who will be the one to lead? All the candidates are speaking to the issue of growth but none is bringing up the subject of the lack of enforcement of the "single family" residential portion of the Bellingham Municipal Code. Everyone wants to sit around the campfire and sing Kumbaya. The problem cannot be solved as long as the city nibbles about the edges of the issue. By nibbling I mean treating the single family home matter as if it were a case of bad rental property owners, alcohol abuse, littering, public urination, parking, etc. These are all symptoms of a more basic problem regarding the approach to zoning enforcement in the city. We spend inordinate hours reviewing, rewording, revising and restructuring our neighborhood plans. Density issues remain a top subject among the citizens and the candidates. All of this becomes meaningless when the basic definition of what constitutes a single family (which is at the core of what constitutes a single family zoning area) purportedly remains elusive. Lack of enforcement has turned parts of this city, zoned single family, into rooming house districts. I have heard countless times that the current code is unenforceable as it is somehow "unconstitutional." My suspicion is that this mantra of "unenforceability" has been repeated so many times that the assumption is that it is, indeed, valid. Would that someone prove me wrong. Yet, I found after only 5 minutes on the web that Bloomington, IN; Allentown, PA; Lincoln, NE; Binghamton, NY; and Ann Arbor, MI, to name a few, have prevailed in court appeals on their definition as to the makeup of a single family for zoning purposes. If I found these references after only 5 minutes on the Internet, would it be too difficult for candidates to determine if their solutions would be applicable to Bellingham? Additionally, which candidates will ask that Western Washington University, Bellingham's 800 pound gorilla, step up to the plate in a much more substantial manner? The university just received $47 million dollars for renovation and expansion of their facilities. What role is the university intending to play in the housing of all the students they plan to attract to the expanded university of the future? Who is talking about that? What about the thousands of students each year who are forced by lack of dormitory space to find affordable housing? Not being stupid, they make the economically viable choice, forming group houses. Unfortunately, however, that practice violates the municipal code. Landlords turn a blind eye as do our enforcers. Even if there were no violations of related codes (noise, litter, parking, etc. ), the mere footprint of 5-10 people in a single-family home creates a substantially different footprint in a neighborhood where the norm is a family with a few children. The efforts of the Campus Community Coalition are laudable and should continue as an educational process for the students, but to pretend that this will solve the problem of zoning and density within the city limits is to bury one's head in the sand. Which candidates will stop wringing their collective hands over the issue of the city enforcing its own laws? If candidates are convinced that the current code is unenforceable, will they have the courage to ask that the council remove it from the books so that city will not continue to play with the minds of the citizenry? If we then need something to replace the definition, which I assume must be done to preserve a basic description of "single family zoning", will candidates, once in office, compel the city's legal "experts" to do their homework and reach out to jurisdictions where zoning is a meaningful concept? This cannot remain in the too-hard-to-do column.